Once, while on a plane landing at O’Hare when I lived in Chicago, the sun was going down and we flew in low over this spectacular building. I’ll never forget that sight. And, yes, it was in winter with snow on the ground. The tenets of the Baha’i faith are pretty straightforward, and immensely progressive. The Baha'i faith resulted from a revelation to the Shiite Iranian Mirza Husayn-Ali (1817–1892), subsequently known as Baha'u'llah (The Glory of God). Baha'u'llah was made to understand that all religions are centered on the same supreme deity, meaning that all world religions are monotheistic, interpreted by various persons chosen as prophets. The three core principles of the faith are: the unity of God, the unity of all religions, and the unity of humanity. The Baha'i Temple in Wilmette, Illinois, was the first Baha'i place of worship constructed in the United States. The architect of the Baha'i Temple ("The Temple of Light"), converted to the Baha'i faith in 1906 in New York. Born in Saint-Célestin de Nicolet, Québec, he had shown a talent for drawing by the age of 8. Interested in architecture, he apprenticed in a church contractor's office, designing his first church in 1892. He also studied as an apprentice to a sculptor, going to Paris, where he was surrounded by great sculpture from the Gothic through the Neoclassical periods. What enthralled him most, however, was the architecture of Paris. He subsequently traveled to Italy, Greece, and Egypt to absorb many different styles of architecture. In 1886 Bourgeois was in Chicago and worked with Louis Sullivan (1856–1924), the pioneer of American skyscrapers. A key feature of Sullivan's architecture was exterior decoration that was strongly influenced by the Arts and Crafts movement, one that borrowed decorative motifs liberally from Medieval, Islamic, and Asian sources. The commission for the Baha'i Temple was proposed in 1909 but not decided in favor of Bourgeois until 1920. 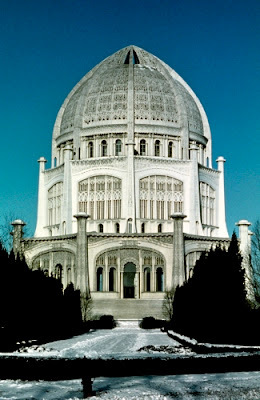 The Baha'i Temple has a silhouette similar to that of the Dome of the Rock in Jerusalem, and, like that building, is characterized by a merging of Western and Islamic styles. The octagonal dome and drum are decorated in a combination of Gothic tracery and Islamic arabesque decoration that encloses a centralized worship space much like the centrally-planned Byzantine churches. 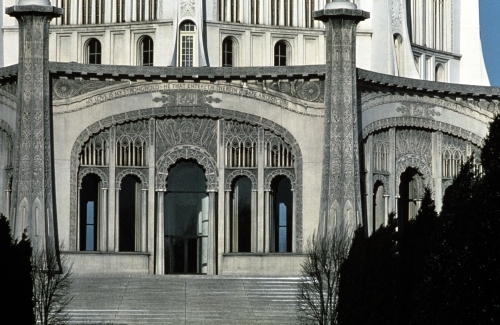 Some of the curving and undulating elements of the façade may refer to Art Nouveau. The peers separating the eight sides of the building bear the names of the major prophets of all world religions. The main entrance door bears a scalloped, horseshoe arch similar to those seen at the Alhambra in Granada, Spain, and the Great Mosque in Cordobá. Interesting. I guess he shows his human side, just like the prophets for all major religions have done.